TripAdvisor, our sister site, unveiled a new set of features on its flight search today—airline reviews and a fees estimator—that give travelers more information about a fare before they book. The airline reviews function as one would expect. Users can rate airlines on a number of factors—value, punctuality, baggage handling, and seat comfort, to name a few—and those ratings are combined into an overall score. Users are asked if they would recommend the airline, and can write short reviews as well. Users searching for flights can get a quick sense of the airline’s overall score by mousing over the logo in the search results. 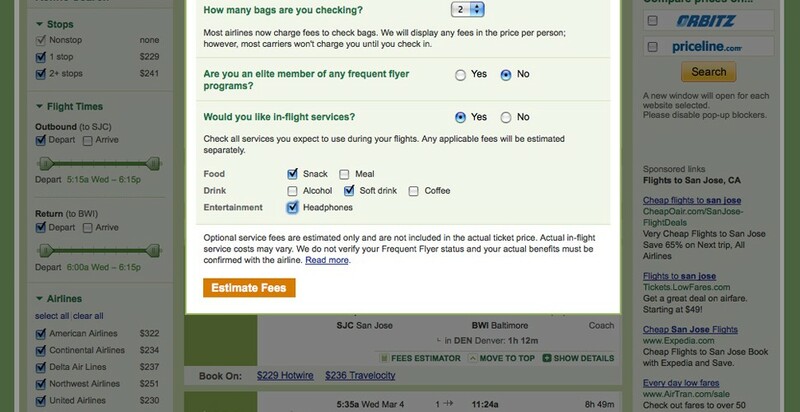 The new fees tool builds on the fees estimator already found on TripAdvisor’s flight search. Now, the search results feature the cheapest base price, including fees for one bag, alongside the overall lowest price at the top of the results display. Click on bag fee price, and Tripadvisor asks you how many bags each traveler is bringing, if you are an elite frequent flyer member in any program, and if you’ll be purchasing any other services. Answer the questions, click “estimate,” and the prices are adjusted to reflect your choices. The benefit of the fees estimator is obvious: One search gives you two base fares, and from there you can pretty quickly estimate the actual total cost of your ticket. It does make me wonder, though, why not just ask those questions at the start? When someone comes to TripAdvisor (or any other flight search, for that matter), can’t it just ask users how many bags they’re bringing after they enter their dates? The airline reviews are useful too, albeit more so with unfamiliar foreign airlines. But unlike hotels, basic airline services vary little from carrier to carrier, and those with good service do an able job of broadcasting it on their own. Still, it’s a nice feature, one I’d certainly consider when deciding between identical fares. Airfarewatchdog, also a sister site of ours, has more detailed route reviews on its site. Readers, what do you think about TripAdvisor’s new features?